Grow your practice easily with Medical Management Online. Top insurance companies across the US, Canada, and Puerto Rico rely on MMO to connect them with independent medical examinations by trusted physicians. We are thrilled to provide regular referrals to these doctors in a way that suits their schedule. 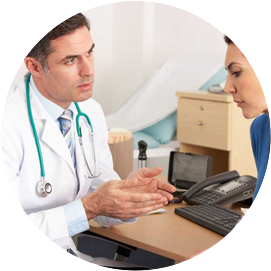 Our referral pool consists of more than 1,000 physicians across a wide range of specialties. Time is valuable and we have built our process to be convenient, paperless and, overall, hassle-free. Becoming an MMO physician can be a great revenue stream for your business without burdening you or your staff. Here are a few reasons doctors love working with us. Get a steady stream of referrals for IMEs and file reviews, while we manage transcription, QA, and final report disposition. MMO will work with you and your staff to schedule examinations and reviews at times that fit for you and your practice. The files you receive from MMO are sorted by provider and chronologically, and are accompanied by a case chronology. We transcribe reports in less than 48 hours and edit them for grammar, punctuation, and completeness prior to forwarding to you for final editing and approval. Invoicing is a breeze with our online system. We don't consider a case closed until you've been paid.